This is a luxuriously large restful space on the upper level of the guesthouse. It is light and airy and tastefully decorated in shades of white. Good for honeymooners or pure self indulgence! Double glass doors open onto a large balcony, where one can enjoy breakfast at the café style table and chairs, or sundowners, or simply sunbathe on the loungers and swing seat. Enjoy magnificent views of the treed garden and huge pool, and wonderous mountain back drop, and the glittering night lights of Newlands and Claremont. The bed is a sumptuous King Extra length, and very comfortably fitted with feather duvet and plenty of pillows, a comforter and electric blanket in winter. The large dressing table can double up as a desk. Upstairs for added security and privacy, and those wonderful views! 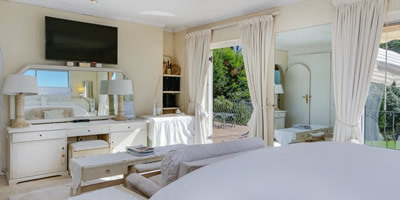 Tastefully decorated in shades of white, perfect for a restful or romantic break. Glass doors and windows open onto huge tiled balcony with swing seat and loungers, umbrella and café style table and chairs, perfect for relaxing sundowners with a view! Large dressing table, with built in hair drier. This doubles well as a desk. Equipped with the basics for simple self-catering and food preparation: kettle, microwave, egg boiler, toaster, sandwich maker. Under carpet heating, central fan plus heat pump for heating or cooling. Comfy couch for “feet up” TV viewing.